Is there anyone on this planet who doesn’t like crepes? Well if there is, I’ve never heard of them. They are easy to make, just a bit time consuming. In the end they are so worth it. The possibilities of what to do with them are endless. They can be for any meal or even a snack. 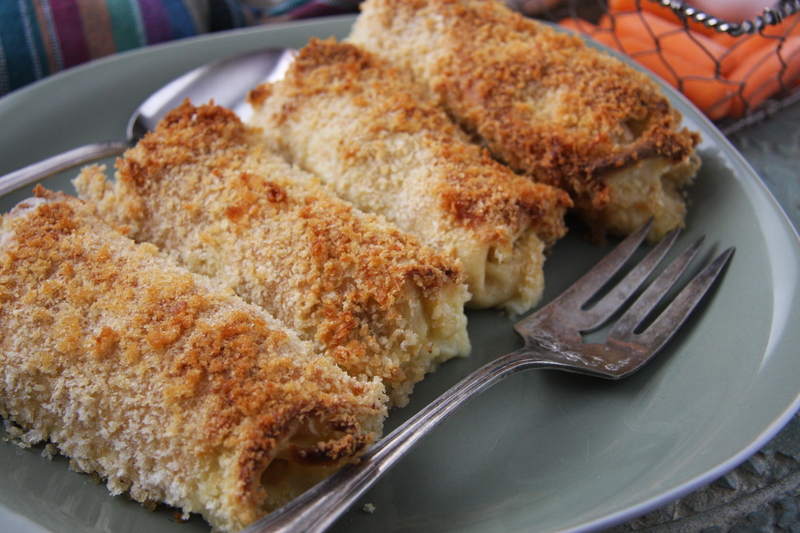 Such a simple thing to make but such an classy thing to serve. I have never heard or seen anyone who isn’t impressed when given a crepe. Always ooohhhs and aaaahhhhs and mmmmmms can be heard. 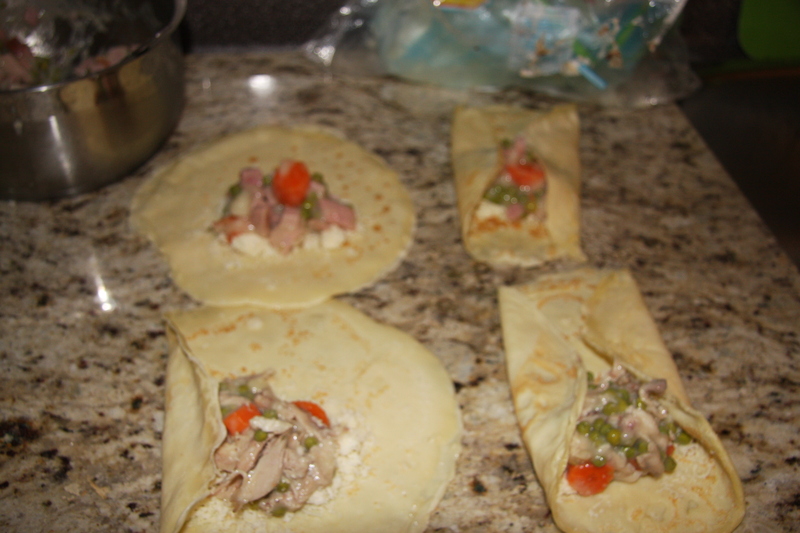 So why not impress your friends and make something, anything with crepes. 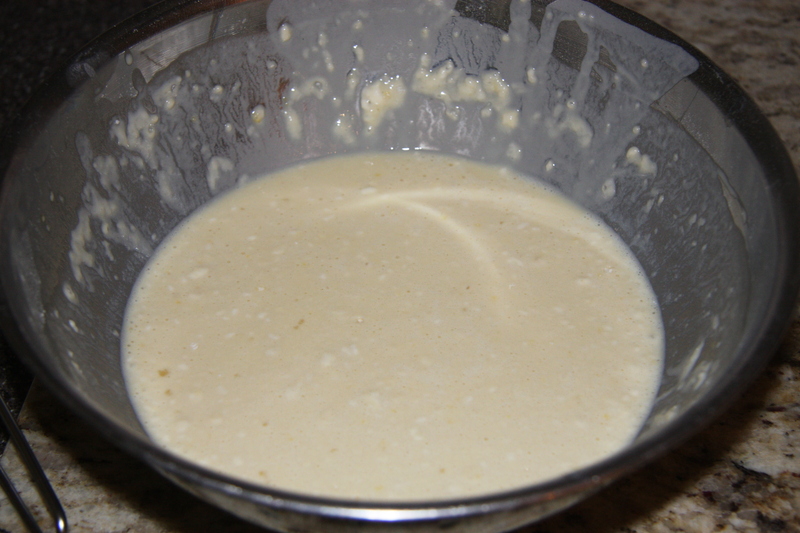 CREPES In a bowl add 1 1/2 cups of flour, along with 2 cups of milk and 3 eggs. Mix well and don’t worry about the little lumps. 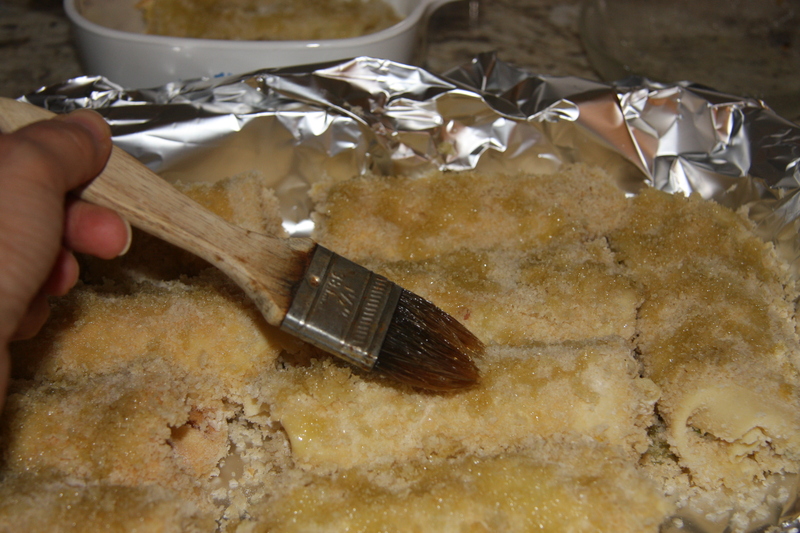 Heat a non stick pan with a glug of olive oil. 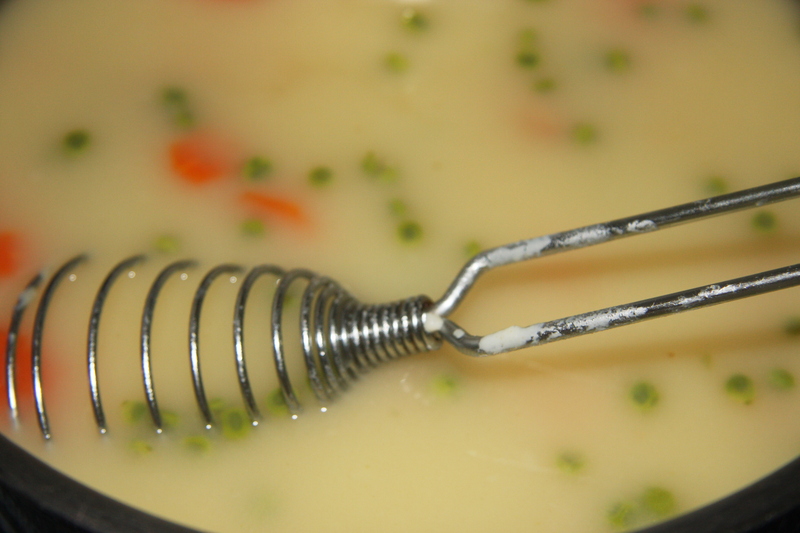 When the oil is hot pour in 3/4 of a soup ladle of batter into a preheated pan. You can put a little less but I like mine thicker so that is what I do. 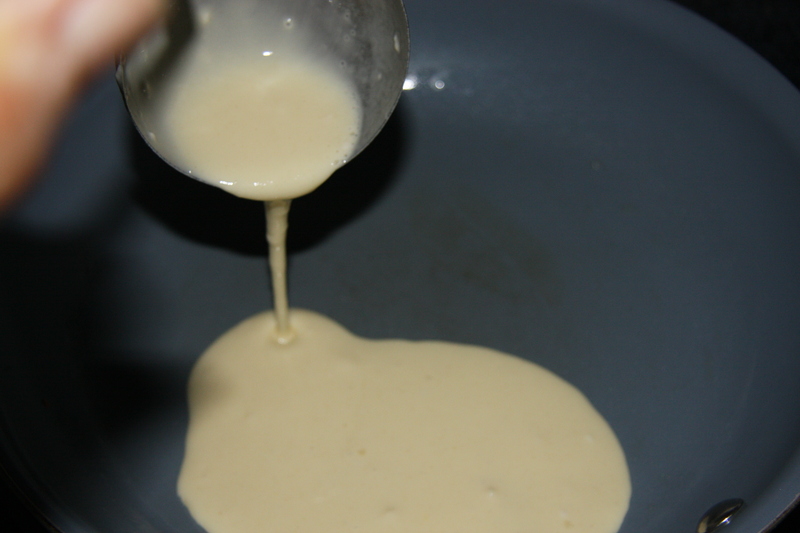 Pick up the pan on an angle and twirl it in a circle to spread the batter around to cover the bottom of the pan. Brown on one side… Then flip to brown the other side. 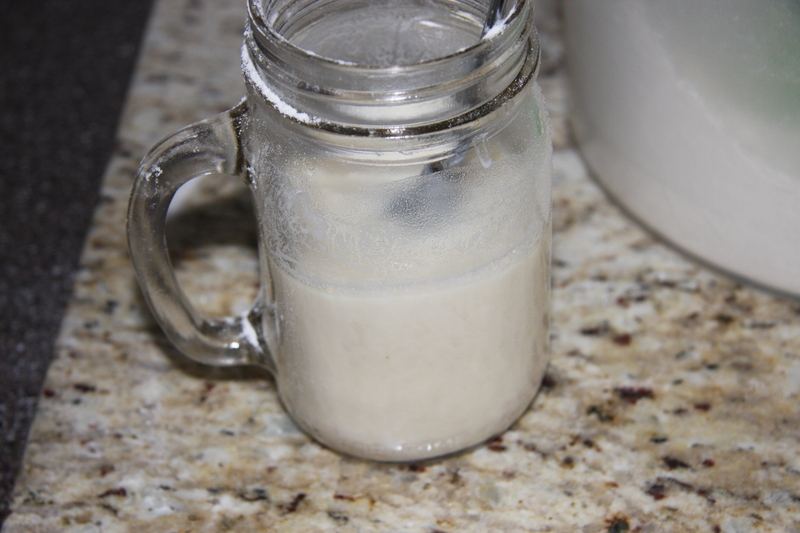 Repeat these steps until all the batter is used up. 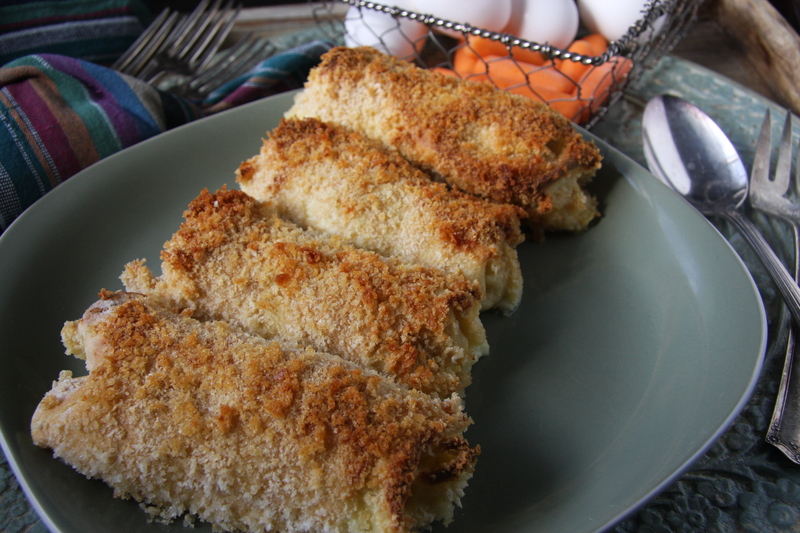 Let them cool, cover and refrigerate until ready to use. I like to make these 1 day ahead then they are ready to go when I need them. Make crepes and set aside. 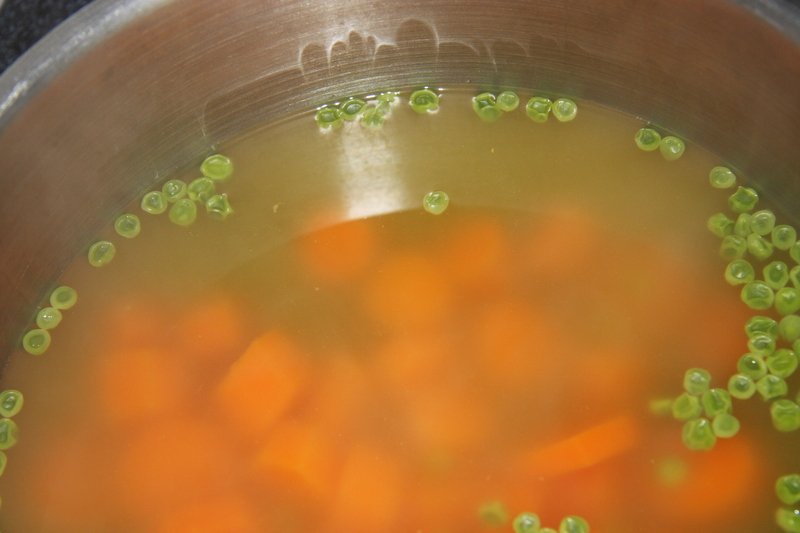 You can cook chicken along with the peas and carrots in the broth or just the peas and carrots with chopped parsley. 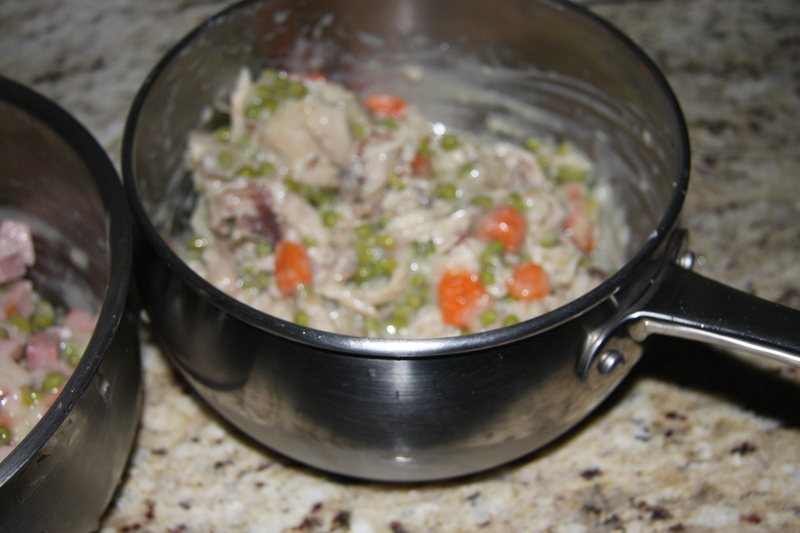 When chicken and veggies are cooked remove the chicken, shred and add the slurry to the broth at first 1/2 then a little at a time, if necessary until it thickens while cooking it. Its like making gravy. 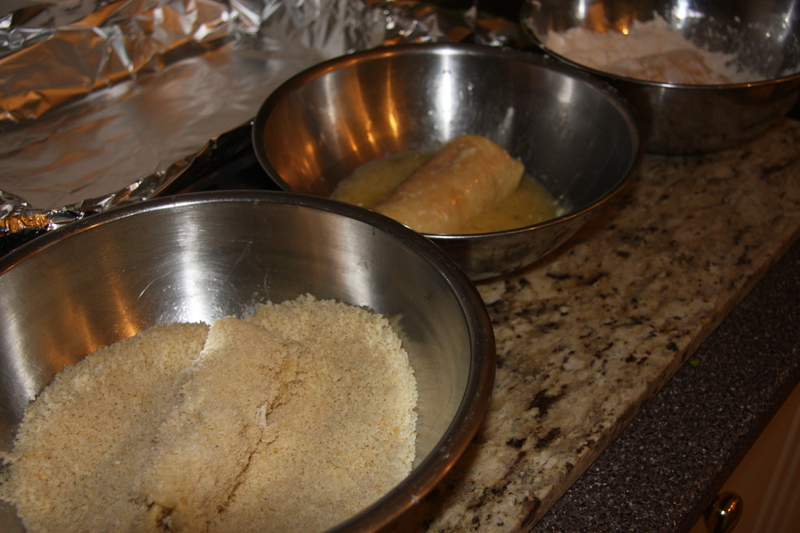 When you get the consistency you would like, remove from heat and divide into 2, cool. 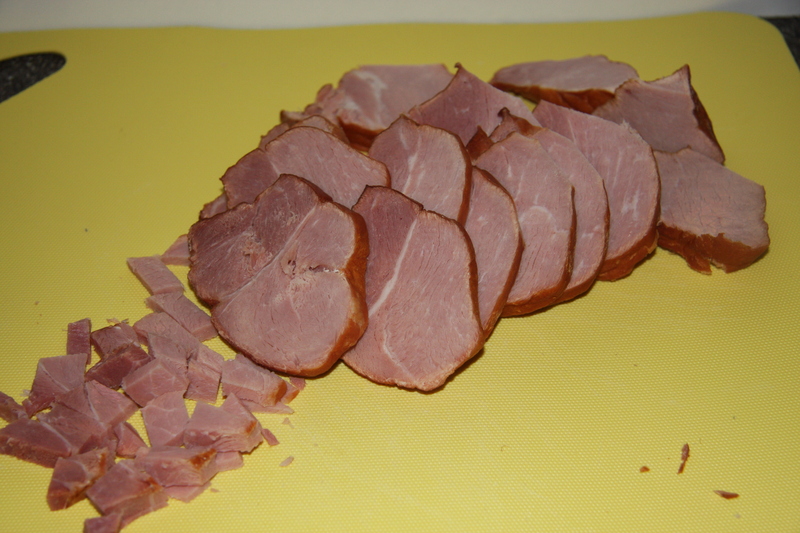 Take your chicken and place into one pot and the smoked ham into the other. 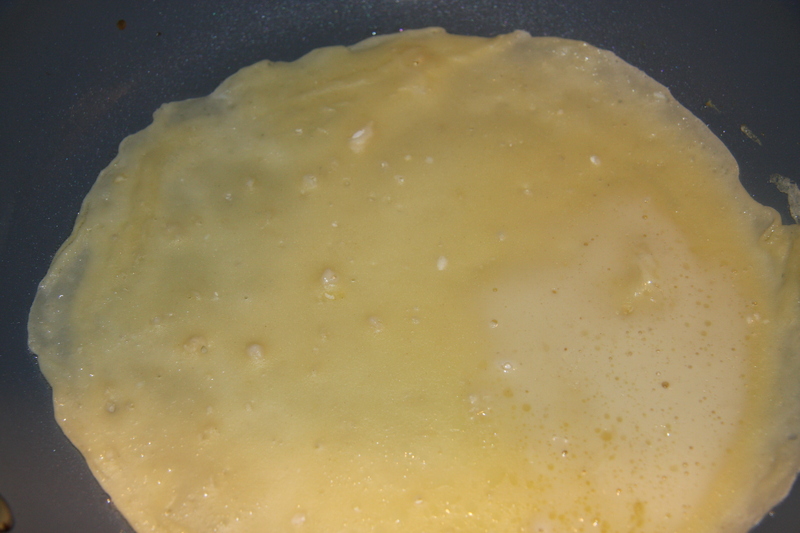 Add 1 egg yolk into both. Mix well. Set aside. Take the crepes and lay flat. 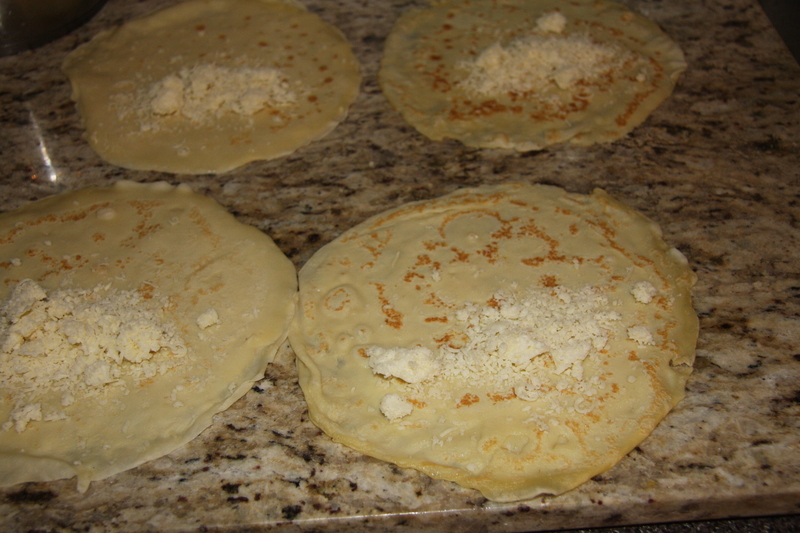 Place 1 tablespoon grated cheese onto crepe closest to you. 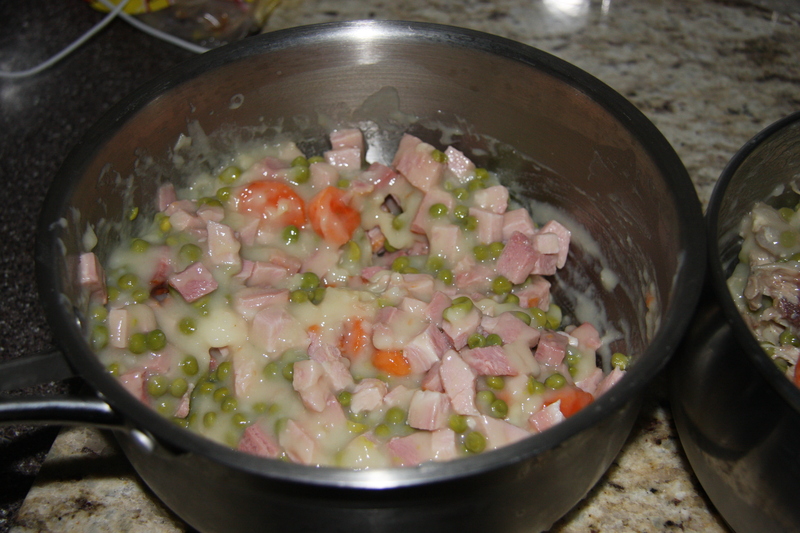 Next 1 tablespoon chicken or ham mixture on top of cheese. 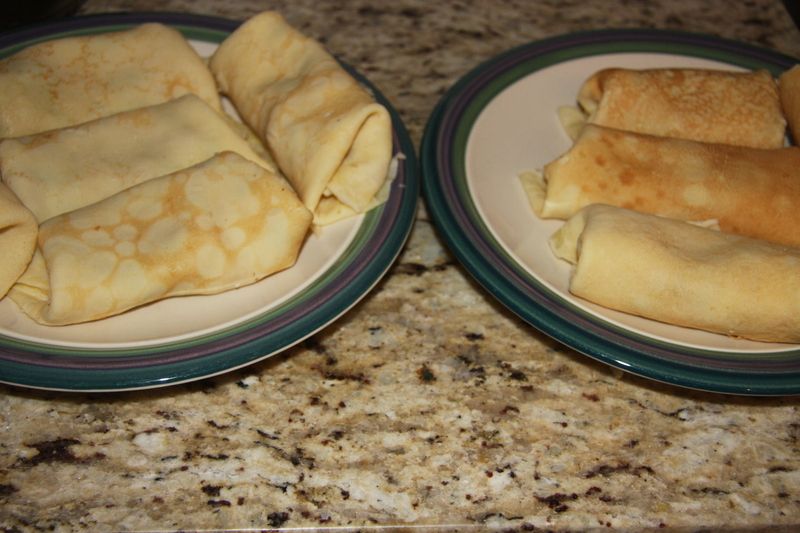 Fold sides of crepe toward the middle and start to roll from end closest to you. Repeat with all the crepes. 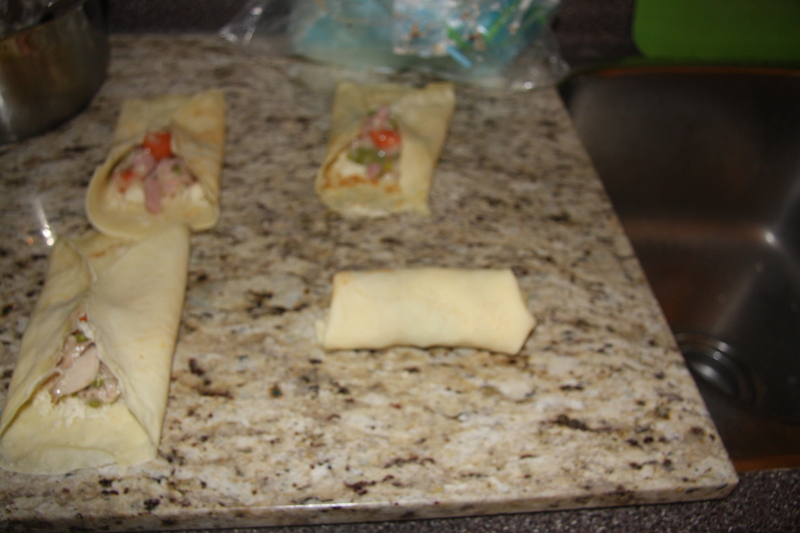 Place the crepe rolls onto a foil lined pan and brush with olive oil, bake at 350 degrees for 40 minutes, uncovered.